Innovative design, high quality equipment and a level of customer service that people rarely experience is truly the core of Illuminations USA. Welcome to Illuminations USA! If you’re looking for premier outdoor lighting fixtures and solutions near Central Florida or the surrounding areas, you will find we offer a wide range of products and services. Whether you want to add lighting for aesthetics or for security purposes, our professionals can enhance your curb appeal with strategically placed landscape and architectural lighting. 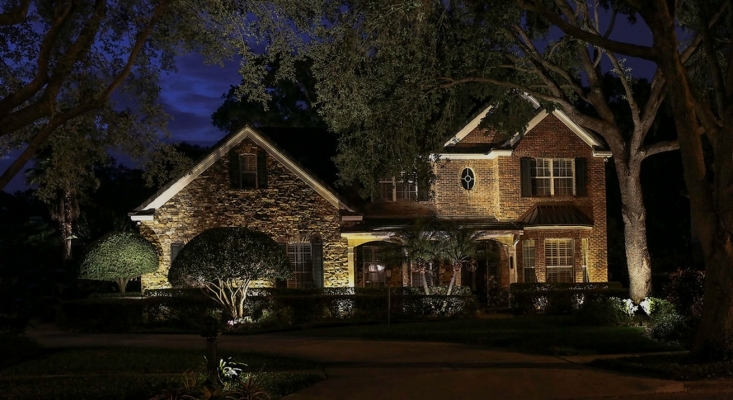 Since 1994, Illuminations USA has designed unique outdoor lighting systems meant to accent the most notable features of homes while also providing the safety and security of a well-lit exterior. Our experienced team understands the importance of proper lighting both inside and outside of the home, which is why our architectural lighting services can be tailored to meet your exact needs. No matter what type of home you own, we will work with you to design a lighting system that works for your property. The right type of lights placed in the right areas can dramatically change the look of your home for the better, not only making it a more comfortable place to spend your time, but also increasing its overall value. As an LED outdoor landscape lighting company servicing Central Florida and the surrounding areas, Illuminations USA also provides Central Florida homeowners with some of the most impressive lightscapes that enhance both the landscape and the architecture features of any building. From grand entrances and leading pathways to beautiful gardens and amazing pools, we will work to accentuate the most appealing features of your home or business. Our expert installation, matched with low-voltage LED architectural lighting, provides added safety and beauty to any structure with affordable and efficient lighting solutions. We offer several different types of lights including both LED and low voltage. These lights offer several advantages over your standard bulbs, including cost efficiency and durability. Our team takes pride in the fact that we stay up-to-date on the latest innovations in the lighting industry, and you can expect our research and innovation to pay off when you take advantage of our services. When you turn to the professionals at our LED outdoor landscaping lighting company, you can expect unparalleled results every time. No project is too big or small for our team to take on, and we will work quickly, yet carefully, to ensure you aren’t waiting around for the finished results. We invite you to explore our website to learn more about the various lighting products and services we have available for our customers in Central Florida and the surrounding areas, or call us today at 407-880-0700 to schedule a consultation! Outdoor cosmetic lighting not only adds aesthetic quality to your home or business, it also reinforces safety and security. Keep guests and family members safe at all hours with illuminated walkways, entrances, and garden paths, eliminating tripping hazards and harmful obstacles. Effective architectural and security lighting also serves as a deterrent for burglars and unwanted guests looking for easy opportunities in darkened homes or businesses. Thank you for visiting our website. Please explore the site for more information on our architectural lighting product and services, as well as testimonials from homeowners we are honored to work for. Contact us for a consultation.